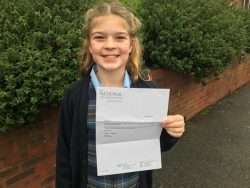 Many congratulations to Cecilia B, Form 3, who has won a place in the National Children’s Choir for 2019. The organisation champions good quality singing across the UK and runs courses during the school holidays for young singers at a number of levels and for different age groups. Cecilia will be coached by high level, professional, choral staff as they prepare for performances, recordings and special events. She joins Anna and Josie Harding who are current members of this dynamic and exciting choir.